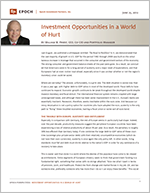 Investment Opportunities in a World of Hurt - Epoch Investment Partners, Inc.
Last August, we published a whitepaper entitled: The Road to Perdition? In it, we demonstrated that the vast majority of growth in U.S. GDP for the period 1982 through 2008 was built on the simul-taneous increase in leverage that occurred in the consumer and government sectors of the economy. The strong consumer and government balance sheets of the past were gone. As a result, we concluded that Americans were in for a long period of austerity and a major reset of expectations, and that Europeans had an even rockier road ahead, especially since it was unclear whether or not the region’s monetary union could be saved. Where are we today? The answer, unfortunately, is a grim one. The debt situation is worse now than it was a year ago, with higher debt-to-GDP ratios in most of the developed world. Fiscal deficits have continued to expand. Economic growth continues to be weak throughout the developed world despite massive monetary and fiscal stimuli. The international financial system remains crippled with large unrecognized losses, and although there has been some improvement in the U.S., Europe’s banks are essentially insolvent. Recession, therefore, seems inevitable within the euro zone. And because currency devaluation is not a policy option for countries who have adopted the euro, austerity is the only path to “fixing” these troubled economies, barring a fiscal union or some sort of euro bond. Especially in comparison with Germany, the rest of Europe seems in particularly bad shape. Indeed, over the past decade, productivity measures suggest the peripheral European countries have been experiencing a loss of relative productivity of about 3% per year. As a result, the periphery is roughly 30% less efficient than Germany today. If one combines the large debt-to-GDP ratios of these countries (sovereign plus private sector debt) with their relatively uncompetitive economies (which do not have their own currencies), austerity is once again the only policy left. In other words, living standards must fall and debt must shrink relative to the nation’s GDP in order for any semblance of a recovery to take place. This is easier said than done in a world where the desires of the populace have come to be viewed as entitlements. Entire segments of European citizenry seem to think that government funding is a fundamental right, something that comes with no strings attached. “Give me what I want in terms of pensions, work, and healthcare. Protect me from change and market forces in my job. Oh, and tax someone else, preferably someone who has more than I do so I can enjoy these benefits.” This social mindset has collided with an economic reality that has caused nine governments to fall since the euro crisis began. Frankly, Europe is a mess and is only going to get messier. Underlying much of this instability is the issue of liquidity. Figure 1 shows the Bloomberg Financial Conditions Index for the U.S. and Europe over the past five years. This index is a collection of measures of money market instruments, bonds, and equities, all of which are converted into a z-score which represents the standard deviation around a norm. The Bloomberg Financial Conditions Index combines yield spreads and indices from money markets, equity markets, and bond markets into a normalized index. As the figure indicates, the world was working pretty well until August 2007, when a French bank had trouble meeting redemption requests and valuing certain assets in one of its funds. The ECB poured in €100 billion of liquidity the following day. Sensing the onset of a liquidity crisis, our Federal Reserve quickly followed suit, creating what was essentially a two-standard-deviation event. (See Figure 1 around August 2007.) The BFCI then moved sideways for just over a year until Lehman Brothers and AIG collapsed: a catastrophic 12-standard-deviation event that created what was probably the riskiest financial moment since WWII. Central banks throughout the world jumped in with very expansive monetary policies and governments dusted off their fiscal expansion plans. As a result, the liquidity crisis was solved in an astonishingly short period of time. A negative 12-standard-deviation mark became a minus 4 measure by April 2009. In the U.S., we were back to normal just over a year later: a remarkable achievement that can be credited to Fed Chairman Bernanke and his policies. Because it is a monetary union and not a fiscal one,1 Europe met a different fate. Even though their liquidity saga started out looking like ours, it wasn’t resolved as neatly. Last summer, Greece’s economic woes began to threaten the entire European banking system. Having Mario Draghi succeed Jean-Claude Trichet as the president of the European Central Bank was a wise move, but the situation continued to unravel nonetheless, as highlighted by the BFCI for Europe.As the figure indicates, the world was working pretty well until August 2007, when a French bank had trouble meeting redemption requests and valuing certain assets in one of its funds. The ECB poured in €100 billion of liquidity the following day. Sensing the onset of a liquidity crisis, our Federal Reserve quickly followed suit, creating what was essentially a two-standard-deviation event. (See Figure 1 around August 2007.) The BFCI then moved sideways for just over a year until Lehman Brothers and AIG collapsed: a catastrophic 12-standard-deviation event that created what was probably the riskiest financial moment since WWII. Central banks throughout the world jumped in with very expansive monetary policies and governments dusted off their fiscal expansion plans. As a result, the liquidity crisis was solved in an astonishingly short period of time. A negative 12-standard-deviation mark became a minus 4 measure by April 2009. In the U.S., we were back to normal just over a year later: a remarkable achievement that can be credited to Fed Chairman Bernanke and his policies.As the figure indicates, the world was working pretty well until August 2007, when a French bank had trouble meeting redemption requests and valuing certain assets in one of its funds. The ECB poured in €100 billion of liquidity the following day. Sensing the onset of a liquidity crisis, our Federal Reserve quickly followed suit, creating what was essentially a two-standard-deviation event. (See Figure 1 around August 2007.) The BFCI then moved sideways for just over a year until Lehman Brothers and AIG collapsed: a catastrophic 12-standard-deviation event that created what was probably the riskiest financial moment since WWII. Central banks throughout the world jumped in with very expansive monetary policies and governments dusted off their fiscal expansion plans. As a result, the liquidity crisis was solved in an astonishingly short period of time. A negative 12-standard-deviation mark became a minus 4 measure by April 2009. In the U.S., we were back to normal just over a year later: a remarkable achievement that can be credited to Fed Chairman Bernanke and his policies. As the figure indicates, the world was working pretty well until August 2007, when a French bank had trouble meeting redemption requests and valuing certain assets in one of its funds. The ECB poured in €100 billion of liquidity the following day. Sensing the onset of a liquidity crisis, our Federal Reserve quickly followed suit, creating what was essentially a two-standard-deviation event. (See Figure 1 around August 2007.) The BFCI then moved sideways for just over a year until Lehman Brothers and AIG collapsed: a catastrophic 12-standard-deviation event that created what was probably the riskiest financial moment since WWII. Central banks throughout the world jumped in with very expansive monetary policies and governments dusted off their fiscal expansion plans. As a result, the liquidity crisis was solved in an astonishingly short period of time. A negative 12-standard-deviation mark became a minus 4 measure by April 2009. In the U.S., we were back to normal just over a year later: a remarkable achievement that can be credited to Fed Chairman Bernanke and his policies.Because it is a monetary union and not a fiscal one,1 Europe met a different fate. Even though their liquidity saga started out looking like ours, it wasn’t resolved as neatly. Last summer, Greece’s economic woes began to threaten the entire European banking system. Having Mario Draghi succeed Jean-Claude Trichet as the president of the European Central Bank was a wise move, but the situation continued to unravel nonetheless, as highlighted by the BFCI for Europe. It was the ECB’s introduction of the Long-Term Refinancing Operation (essentially a three year Repo) that finally put a temporary halt to the risk of bank failure. Markets responded very positively, as financial institutions were able to borrow what was, in essence, free money that was then used to buy their country’s sovereign debt at yields three to five times higher than the cost of capital available through the LTRO. As a result, the debt yields among the PIIGS fell quite a bit from their November 2011 levels. But while the liquidity risk was materially lessened, the solvency problem was getting worse. Just look at Figure 2. Debt to GDP for virtually every country has been rising rapidly since the crisis began in 2007. The State is playing a larger and larger role in the economy in order to offset the costs of an enormously over leveraged financial system. Figure 2: Debt Overhang Will Persist For Many Years – Why The 90% Line? Bubble Sizes Correspond to the GDP of the country. The magnitude of our debt problem is striking and bodes ill for the near- to medium-term health of the global economy. Note the dark horizontal line at 90% in Figure 2. When sovereign debt to GDP goes above 90%, three things happen. First, future growth rates of GDP shrink by 100 to 150 basis points, as debt service costs consume more and more of annual GDP. Second, structural unemployment rises and stays well above average for many years. Third, the recovery from the financial crisis is slow, ranging from five to eight years.3 So according to Figure 2, the world is in for a growth rate well below that of the past three decades. The situation described in Figure 2 had many causes, one of which was certainly the aforementioned sense of entitlement felt by the citizens of the developed world: a point of view that politicians were more than happy to support if it helped them get elected. Developed countries have had their cake and eaten it too for many, many years. If we wanted something, there were no real sacrifices to be made. We simply paid for it in cash or charged it to the future. When current incomes began to stagnate in real terms — as they have over the past two decades — we began to borrow more in order to keep feeding our desires, securitizing assets wherever possible to fund consumption. In the U.S., our houses became ATMs. In the words of Warren Buffet, the U.S. was becoming a nation of sharecroppers; to maintain our living standards, we were selling off what we owned even if that meant we would eventually be left with nothing. Our behavior, based on this false sense of entitlement, must change. There is a definitive and difficult choice to be made with regard to how we use our capital. When we have a dollar, we can choose to spend it or we can use it to pay down debt. We can no longer charge things to the future. We must bring the growth rate of our debt below that of our GDP in order to shrink the ratio of debt to GDP: an achievement that, while necessary in the long-term, will cause near-term growth to slow from historical averages. But how do we accomplish this end when the will of the populace seems to resist it? Despite the pain of the recent recession, we still want our entitlements. We have yet to fully realize that privileges are not rights and that any politician who assures us otherwise is simply not telling the truth. factor: debt. In Figure 3 , we show global GDP growth alongside workforce growth, productivity, and inflation. The black line shows debt to GDP in the developed world. Clearly, debt has had a profound influence on the three determinants of GDP. Today, with future debt increases limited by a slow-growing economy and debt-to-GDP ratios at historically dangerous levels, growth will be reduced to the extent debt reduction occurs. With respect to the U.S., this deleveraging is already underway. Europe, too, is being forced to slow its rate of debt accumulation due to the fact that money can no longer be borrowed cheaply. Taken together, these attempts to control the growth of debt have had a very deflationary effect. The best way to solve the debt problem is to grow. But that appears incredibly difficult today. The second-best way is to inflate the economy so that debt is paid off with cheaper currency. The world’s central banks are desperately trying to inflate but, so far, this has not resulted in growth but in liquidity. Most of the liquidity that has been created is trapped in the banking system, as demand for loans has been modest due to slow-growing economies and increased regulatory oversight. Nevertheless, central banks will keep trying, largely because of their common dedication to the Taylor Rule. This rule was proposed in 1993 by John Taylor of Stanford University in his attempt to formulate a policy for the fed funds interest rate. It is based on the pursuit of twin mandates: limiting inflation and generating full employment. Although there are now several variations to the original equation, the initial idea was straightforward. With respect to the inflation variable, the rate should be 1.5 times the trailing-four-quarters level of the GDP deflator, while the full employment variable should be 0.5 times the output gap measure (the difference between theoretical GDP at full employment less the actual GDP level at present). Each variable carries a weight of 50% in the model. Hence, if inflation were 2%, then that variable suggests the central bank’s interest rate should be +3%. If the output gap is 6%, that variable suggests a rate of -3%. So a central bank rate of 0% is the target when we combine the two variables and their weights in our example. Indeed, given the slowdown in the global economy, an argument can be made for the central bank rate to be a negative number in real terms. Bernanke has effectively recommended as much, and soon we believe we will see Draghi take ECB rates to zero as well in an attempt to slow the development of the impending recession in Europe. Interest rates will stay low for a long time until either growth accelerates or inflation arrives. In the meantime, it is highly likely that some form of quantitative easing and a proposal to guarantee sovereign debts will be considered in Europe: a step that, as we previously mentioned in The Road to Perdition?, will be taken more out of fear than wisdom. In a world of slow growth, the potential disintegration of the euro, and a slowdown in China, what are the investment opportunities, if any? To answer this question, let’s take a quick look at the relationships between the real economy and the financial economy, as shown in Figure 4. We have already discussed the components of GDP, but not its link to equity earnings. If one holds profit margins constant, nominal GDP and earnings are highly correlated over time. This means earnings reflect inflation and capture productivity gains. No other asset class does both. This is why investors both want and need to own equities in the long run. The mechanism behind the enduring attractiveness of equities is as follows. Inflation drives P/E ratios through the mechanics of interest rates. P/E ratios and interest rates are inversely correlated, with a correlation coefficient of negative 0.8. If we square the correlation coefficient (coefficient of determination) this suggests about two-thirds of the change in P/Es is caused by interest rate movements. The P/E ratio is also affected by future market volatility measures relative to past ones (if volatility is higher, there is downward pressure on P/Es) and lower expectations for economic growth relative to long-term averages (if growth rates are lower, there is more of a headwind for the expansion of valuation multiples). The takeaway from Figure 4 is that equities hedge inflation and capture productivity growth. If policy makers can create either growth or inflation, equities will win. And they will win big relative to bonds, which would be severely hurt by the eventual rise in interest rates. Nevertheless, in the very short run, bonds will probably be viewed as safe havens until the euro crisis is concluded and either growth or inflation catches on. What equity strategies will work best? Figure 5 shows a rolling ten-year history of returns along with returns by decade since 1927, which have varied from 0% to nearly 20% with a mean return of over 9%. There are only three determinants of returns — earnings, dividends and P/Es — but their order of importance varies greatly from decade to decade. In the 1980s and 1990s, P/E multiples quadrupled as interest rates fell from 13% to 6%. Only one concept really mattered in those days: staying fully invested with a Beta of at least 1. Capturing economic growth and improving valuation metrics were everything. Volatility management strategies were buried in an avalanche of growth and P/E expansion. As a result, most hedge funds went out of business. Fast forward to the decade of the 2000s. During this period, ten-year equity returns were 1%, volatility was high, and two market crashes occurred. Volatility strategies became popular, particularly if they had high-single-digit returns. The attraction of these strategies continues to this day. Another type of strategy has proven relevant in this environment as well. Whereas dividends did not matter in the ‘80s and ‘90s, they have dominated returns in equity indices in the last decade. In a world of low growth, low interest rates, and a low likelihood of P/E ratio expansion, dividend strategies will continue to prove to be very successful. Not only will dividends as a percentage of total return be higher than historical averages, the demographics in the developed world will require an increasing number of income solutions. Such income solutions need a growth rate and must hedge against inflation. Thus, equity dividend strategies will play a significant role in long-only opportunities. All told, we’re in for some rough sailing. The overall macro environment will get worse before it gets better. Growth will be well below historical averages and volatility in the capital markets will remain elevated. Nevertheless, investors need to capture productivity growth and protect themselves from inflation. Plus, a very large demographic will require an income stream to finance retirement needs. For these reasons, low-volatility strategies driven by free-cash-flow methodologies should win in the long-only world, particularly as “downside capture” ratios, Sharpe ratios, and information ratios trump the principles behind the traditional nine-box model of manager classifications based on the accounting metrics of price-to-book value ratios, price- to-earnings ratios, and mean-reversion assumptions. Dividend strategies are in the early days of dominating traditional equity products. Whereas dividends mattered little in the 1980s and 1990s, they will play a central role in the coming years. For example, U.S. companies paid out a net $24 billion in dividends in the first quarter of 2012, a near 30% increase from a year ago. The number of U.S. firms boosting their dividends rose at a similar rate to 677. Meanwhile, payout ratios of around 30% are far below their historical average of 52% and companies have record amounts of cash on their balance sheets, which means that few constraints exist for those firms wishing to maintain or increase their dividend payouts. Importantly, capital returned to shareholders will include not only cash dividends but share buybacks and debt pay downs, as well. Collectively, we call these measures “shareholder yield,” and we foresee significant rewards for the investor willing to seek them out. Finally, it’s important to keep a close eye on opportunities beyond our own borders. The world has globalized at a rapid pace over the past 30 years. Global exports relative to global GDP has risen 50% over that period as the Law of Comparative Advantage played out in earnest. The changed nature of supply chains and the resulting effect on world commerce has led to the development of “global champions” that have the ability and scale to reconfigure their factors of production and position themselves to the areas of future growth, no matter where they appear. Concentrated equity portfolios focused on these companies will be a winning strategy in the future. In recent months we have concluded that, whether or not Greece stays in the euro, a rescue demands more. If it is to banish the spectre of a full break-up, the euro zone must draw on its joint resources by collectively standing behind its big banks and by issuing Eurobonds to share the burden of its debt. We set out the scheme’s nuts and bolts below. It is unashamedly technocratic and limited, designed not to create the full superstate that critics (and we) fear. But it is plainly a move towards federalism—something that troubles many Europeans. It is a gamble, but time is running short. Rumours of bank runs around Europe’s periphery have put savers and investors on alert. The euro zone needs a plan. All good, except that the people who believe that countries would be better off without the euro gloss over the huge cost of getting there. Even if this break-up were somehow executed flawlessly, banks and firms across the continent would topple because their domestic and foreign assets and liabilities would no longer match. A cascade of defaults and lawsuits would follow. Governments that run deficits would be forced to cut spending brutally or print cash. A lot, according to some gung-ho federalists. For people like Germany’s finance minister, Wolfgang Schäuble, the single currency was always a leg on the journey towards a fully integrated Europe. In exchange for paying up, they want to harmonise taxes and centralise political power with, say, an elected European Commission and new powers for the European Parliament. Voters will be scared into grudging acquiescence precisely because a euro collapse is so terrifying. In time, the new institutions will gain legitimacy because they will work and Europeans will begin to feel prosperous again. constitutional constraints. Indeed, they can be built from last autumn’s beefed-up “six pack”, which curbs excessive borrowing and deficits; and January’s fiscal compact, which enshrines budget discipline in law and is now being ratified across the euro zone. The Law of Comparative Advantage is one of the most powerful laws in economics. It drives any understanding of international trade and is behind the rapid rise of globalization that commenced with the fall of the Berlin Wall in 1989. Around that time, nearly three billion people joined our world of commerce, but brought little capital with them. A gigantic labor arbitrage ensued which is still playing out today: the West, along with Japan, contributed capital and technology and the emerging economies contributed an enormous supply of labor. As a result, our world became more interconnected than at any point in history. The nature of supply chain management was transformed, and “global champions” arose: companies that have the ability to reconfigure their factors of production and position themselves for future areas of growth anywhere in the world. Today, we believe that concentrated equity portfolios focused on these companies should be a winning strategy going forward. Home country bias, while still evident, diminishes every year as investors seek access to global growth through multinational companies. To better envision the powerful role of the Law of Comparative Advantage, imagine two countries, A and B, and two products, food and clothing. From a resource standpoint, it takes country A one day to make one unit of food and two days to make one unit of clothing. Country B takes three days to make one unit of food and four days to make one unit of clothing. As Figure 1 shows, country A is more productive than B in both products in an absolute sense. However, each country wants an equal number of each good. So they have to trade. B will not trade unless it wins and neither will A. We can see that by producing to each country’s relative advantage we have six more units of food and clothing — 100 in Figure 3 versus 94 in Figure 2. How should the six units be apportioned between the two countries? From Figure 1 we can see that A is three times more productive in food than B, and two times more productive in clothing than B. Hence, roughly speaking, A would get two-thirds of the increment and B would get one-third. Move now to Figure 4. A now has 70 units of food and clothing in equal proportions, just as it desired, and B has 30 units food and clothing in equal proportions as well. BOTH COUNTIRES HAVE WON. By allocating resources to the production of the item with the greater comparative advantage, and then trading the excess of that good with the other country for the second item it desires, each country is able to come out on top. Through trade, A now has 70 units of food and clothing versus the 66 it had before trading (Figure 2). B has prospered as well with its combined total units rising from 28 to 30. This is the power behind globalization: a force that is unlikely to diminish unless politicians are foolish enough to erect unnecessary trade barriers and capital controls. If these obstructions arise, the standard of living will decline everywhere. Today, the world is functioning according to the prosperous model outlined in Figure 4. If barriers are erected to trade, we would slide backwards from the 100 units of combined production and potentially all the way back to 94 units, causing poorer living standards throughout the world. 1Milton Friedman has suggested that the euro may be fundamentally flawed because there was no fiscal union provision at its inception. 2Please see the attached Appendix I, which offers The Economist’s opinion on how to save the euro. 3Reinhart, Carmen M. and Kenneth S. Rogoff. This Time is Different: Eight Centuries of Financial Folly. Princeton: Princeton University Press, 2009.